Paris is glowing. Photo courtesy of Moyan Brenn. 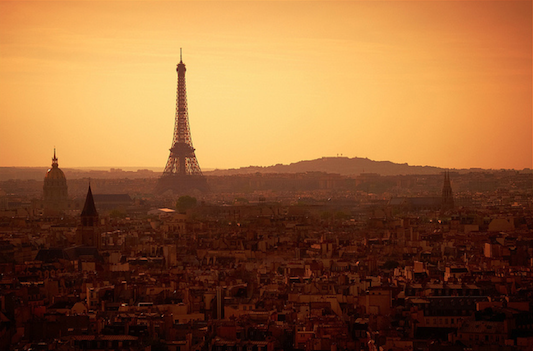 Hemingway's Paris is the one we all dream to see one day. The disregard for rules and lavish lifestyles of his characters cast a strange romance on the City of Lights that we modern Americans can only hope to experience. To live Hemingway's reality might have been overstimulating, but instead, The Sun Also Rises transports us to the smooth and elegant Paris of the '20s. "In the morning I walked down the Boulevard to the Rue Soufflot for coffee and brioche. It was a fine morning. The horse-chestnut trees in the Luxembourg gardens were in boom. There was the pleasant early-morning feeling of a hot day. I read the papers with the coffee and then smoked a cigarette. The flower-women were coming up from the market and arranging their daily stock. Students went by going up to the law school, or down to the Sorbonne. The Boulevard was busy with trams and people going to work. I got on an S bus and rode down to the Madeleine, standing on the back platform. From the Madeleine I walked along the Boulevard des Capucines to the Opera, and up to my office. I passed the man with the jumping frongs and the man with the boxer toys. I stepped aside to avoid walking into the thread with which his girl assistant manipulated the boxers. She was standing looking away, the thread in her folded hands. The man was urging two tourists to buy. Three more tourists had stopped and were watching. I walked on behind a man who was pushing a roller that printed the name CINZANO on the sidewalk in damp letters. All along people were going to work. It felt pleasant to be going to work. I walked across the avenue and turned into my office." This entry is excerpted from The Sun Also Rises, by Ernest Hemingway.